Twitch wasn’t a thing when Just Cause 2 grapple-chuted into view, but Avalanche reckon their upcoming second sequel will fit right in. So confident are they that zooming propane tanks are the stuff of streaming that they’re outsourcing their launch trailer to their players – offering a $5,000 prize to the winning entry. The video must last between one and two minutes, and will be judged by Square Enix and Avalanche across three categories: Best Action, Best Use of Audio and Best Humour. The Best Overall Winner will see their handiwork named the official Just Cause 3 launch trailer. Just Cause 2 is one of the very best sandbox games on PC. Have you played all the others on that list? 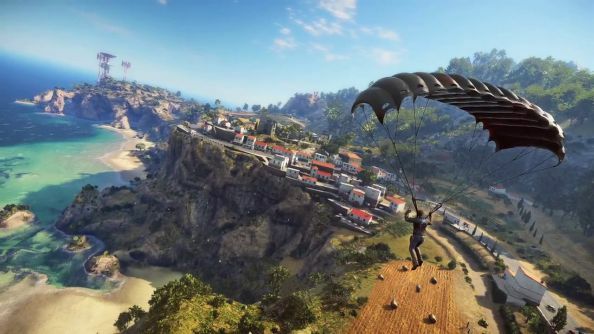 Obviously, most would-be players don’t have access to Just Cause 3 to assemble their own footage yet – so they’ve been given access to a dedicated kit made up of sufficiently entertaining antics, plus licensed music from Italian EDM producer Razihel. Recording and editing tools come in the form of Cakewalk’s SONAR software on Steam. Cakewalk are providing prizes for the runners-up too, alongside a few other electronic gear manufacturers. The deadline is November 12th, 23:59 GMT, and Just Cause 3 is out for “high-end” PCs on December 1st. Avalanche point out that there are over four million fan-made Just Cause 2 trailers on YouTube, so maybe they’re onto something. What do you think?